For some, trainspotting gives the impression of older gentlemen huddled around on a packed station platform in anoraks waiting for a special train. But really, trainspotting is a brilliant way to explore some of the most picturesque parts of the country while seeing some of Britain’s finest trains and railways. With so many individual and striking stations scattered around the most scenic corners of Britain, anyone with an interest of the outdoors or railways, whether that is by being involved in rail recruitment or through trainspotting can come together to appreciate these places. You may still need to bring an anorak or other waterproof because we cannot guarantee sunshine, but we can ensure that you are going to be visiting some beautifully scenic spots and see some equally impressive trains with our guide to the best trainspotting locations in Britain. 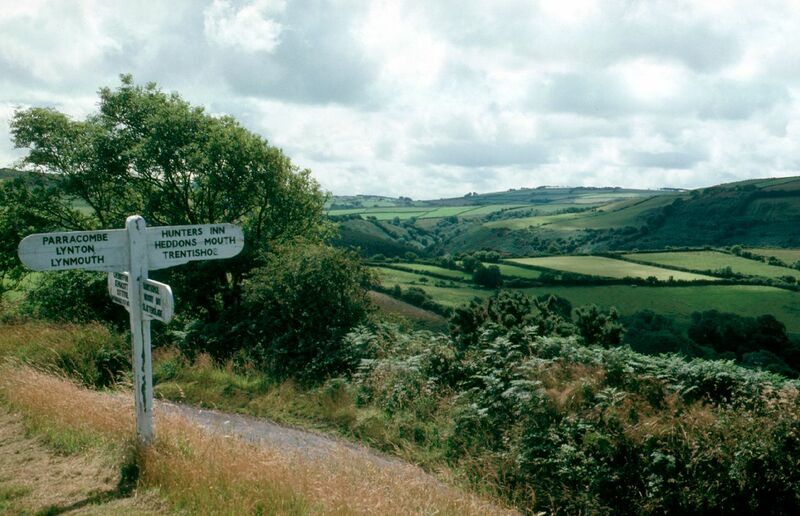 Exmoor National Park is a beautiful combination of rugged moorland, farmland, deep valleys and vast woodland. The landscape has changed over time, as people and nature have made the moor home for thousands of years. It is one of the finest locations in the South West of England for a walk, where you can stroll along the stunning plunging cliffs into the Bristol Channel. The National Park itself offers you 267 square miles of changing scenery, but for the train enthusiast you should head to Woody Bay station. Here you will find the highest narrow-gauge railway in England: Lynton and Barnstaple. The line closed back in 1935, but is currently run by volunteers 1,000 feet above sea level. 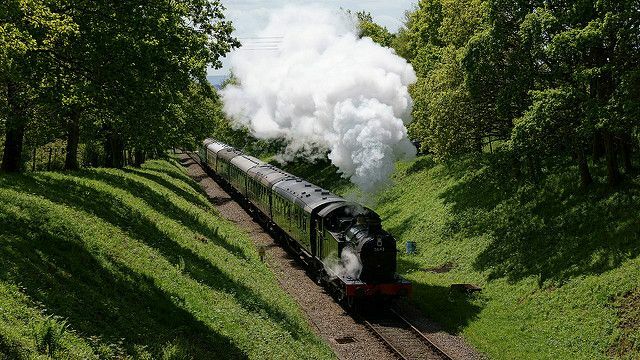 For over 50 years, volunteers at the Bluebell Railway along the border of East and West Sussex have been conserving this line in a picturesque part of the country. Its name comes from the banks of bluebells which blossom between late April and May, making for a beautiful trainspotting location. There are countless walks and vantage points for you to spot trains chugging along the line, as you make your way along these ancient paths. 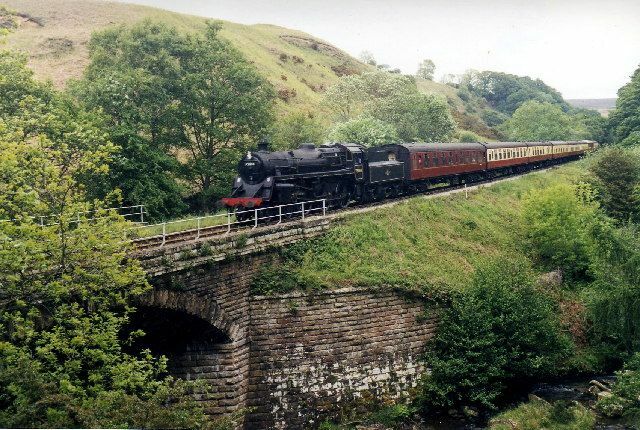 Leading you through wooded valleys, across rivers and meadows filled with wild flowers, there are a few old bridges where you can stand and appreciate the iconic smell of coal and steam from the passing locomotives. Yorkshire and trains go hand-in-hand, given that it is home to the National Rail Museum , where you can find over 1,000,000 objects from more than 300 years of railway history and is the largest collection of railway paraphernalia in the world. It is also famed for its rugged countryside and brilliant walking locations, making the North York Moors National Park a must-visit location for anyone interested in trains. The North Yorkshire Moors Railway runs all the way along to Whitby, as it winds its way through the moors and countryside. For the best vantage point of the line, you should head up to the Skelton Tower at Corn Hill Point. Or for any Harry Potter fans, you can visit Goathland Railway station which you will recognise as Hogsmeade station in the films. Or for lovers of the small screen, the station is also synonymous with the Yorkshire television classic, Heartbeat. 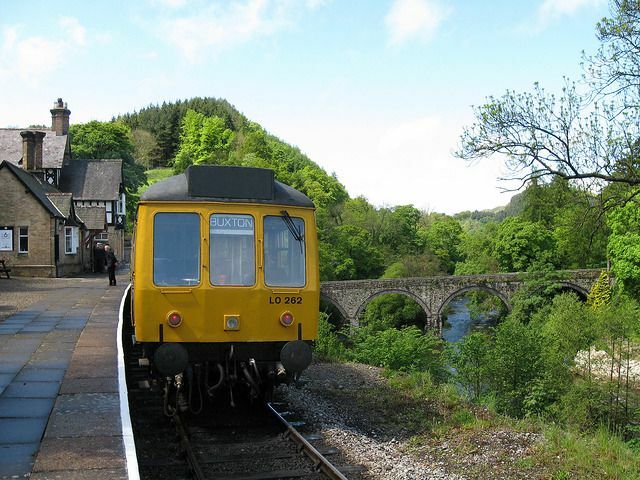 This heritage railway runs for 10 miles between Llangollen and the idyllic town of Corwen in the Dee Valley. A spokesperson for Llangollen Railway told us about the history of the line and station. Beside the historic Dee Bridge, built in 1345, the line follows the River Dee which has been classed as a Site of Special Scientific Interest (SSSI). This line snakes through some of the finest natural landscape in North Wales, offering countless numbers of beauty spots for you to take in spectacular sites of the line and its trains. The spokesperson pointed out five particular points of interest that you can see and visit from the line. Here you can find a medieval bridge and corn mill (now a pub/restaurant) with waterwheel and weir. The town falls is a popular spot for canoeists and the occasional heron, while Castell Dinas Bran perches some 1000ft above the town. It was fought for in the Border wars between the English and Welsh and reputedly has Arthurian legends associated with it. The chain bridge built in 1814 to link to Telford’s A5 and deliver coal for sale in the valley is a real point of interest, twice washed away by floods in the River Dee in 1870 and 1928! The Horseshoe Falls on the River Dee above the station were built by Thomas Telford to divert water from the River Dee into the Llangollen Canal. Frequently used as a film and TV set to depict the evacuation of children from the industrial towns in the Second World War. The home of Owain Glyndwr (1354-1416), a Welsh Prince who rebelled against English rule in 1400. He won a number of battles, even capturing Conway Castle. His rebellion was eventually worn down by stronger English forces. Also home to a medieval bridge (1661) and large C19th houses built as holiday homes by rich Liverpool merchants. The temporary station of our new extension which was opened for business on 1st March 2016. Building work continues to put in a permanent structure and the run around loop for the locomotives. All donations toward Phase II of this project are very welcome! In Spring the valley is alive with the bustle of young lambs, while in Autumn the line and the area is awash with warm colours of red and amber and the leaves begin to fall. Another one for the Harry Potter fans out there, the Glenfinnan Viaduct is a scene of staggering natural beauty in the Scottish Highlands. This spot is perhaps the most gorgeous in our list, as the old steam locomotives pass over the bridge, it will enchant any seasoned trainspotter and inspire any novices. The Jacobite steam train is famed for doubling up as the Hogwarts Express in the Harry Potter films and when you look around the area, you can see why they chose this location. 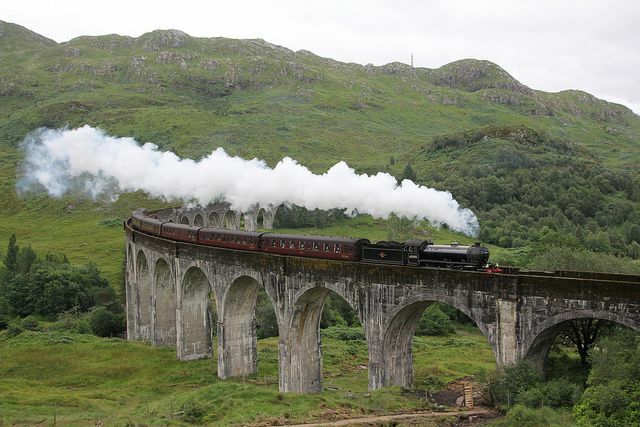 The journey itself has been described as the ‘greatest railway journey in the world’, as you follow the line through quaint Scottish villages like Morar and Mallaig, through to the silvery sand beaches that appeared in Highlander and Local Hero. Particularly in autumn, there is something enchanting about this spot. Without question, looking out at the viaduct is the highlight, but there are numerous trails and tracks to enjoy. It doesn’t matter if you are on holiday to the South West, or if you live in the Yorkshire Moors, across the country you will be able to find a stunning location for your day of trainspotting.